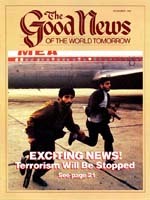 Bible prophecy reveals events of our time and world-shaking events soon to change your life. A major world-shaking event as foretold in the symbolic language of a mysterious, world-dominating, wild beast. The entire beast of Revelation 17 — the revivals of the Roman Empire-is a part of the seven heads of Revelation 13 and Daniel 7 because it comprises the last seven horns. Yet this revived Roman Empire is "the eighth" system, differing from the seven before it (Revelation 17:11). Here are all the Bible scriptures speaking directly of this number: "And that no man might buy or sell, save he that had the mark, or the name of the beast, or the number of his name. Here is wisdom. Let him that hath understanding count the number of the beast: for it is the number of a man; and his number is Six hundred threescore and six" (Revelation 13:17-18). "And I saw as it were a sea of glass mingled with fire: and them that had gotten the victory over the beast, and over his image, and over his mark, and over the number of his name, stand on the sea of glass, having the harps of God" (Revelation 15:2). From these scriptures, we have the following definite points: 1) The beast has a number and may be identified , if we have wisdom , by this number. 2) The number is 666. 3) We are told to count this number — that is, add it up. The same Greek word is used elsewhere only in Luke 14:28: "Count the cost." 4) This number, 666, is the number of the beast. The only Bible interpretation of this symbol, "beast," is a kingdom or the king who rules a kingdom and therefore really is the kingdom (Daniel 7:17-18,22-24, 27). Therefore this number 666 must be the number of the KINGDOM , or GOVERNMENT, or EMPIRE, as well as that of the king who founds or rules it. 5) The expression "the name of the beast, or the number of his name" makes plain that the number 666 is the number of the name of the kingdom or empire. 6) The expression "it is the number of a man" shows we must also count this number in the name of the king, or ruler, over the kingdom identified as the "beast." In the 17th chapter of Revelation we find a beast, and a woman — a great, wealthy but fallen woman — who was riding the beast. The Bible describes the symbol "woman" to mean a church (see II Corinthians 11:2, Revelation 19:7, Ephesians 5:22-27). On the other hand, "beast" is a symbol of a kingdom, or empire. This beast had a deadly wound (Revelation 13:3). That means the beast ceased altogether to exist or function as it had since 31 B.C. Yet its deadly wound was later healed, after which (verse 5) it continued to exist another 1 ,260 years! Those who believe a church is the beast say this deadly wound came in 1798. But the church did not cease to function in that year. Napoleon's abuse of the pope in 1798 could in no sense be called a wound to death. And those who teach this do not expect that church to continue on another 1,260 years. The founder and first king of Rome was Romulus. The Ro man Empire was named after him. His name, the name of a man, is the name of the kingdom. Every citizen in the kingdom bears the same name — each is a Roman. When John wrote this Revelation, telling us to count the number of the beast, he wrote in Greek, so we should look for this name, and the number 666, in this language recognized in the Bible, not in the Latin. We are all familiar with the Roman numerals, where letters are used for numbers: I is 1 , V is 5, X is 10, etc. But many do not know that the Greek language, the language in which the book of Revelation was written, also uses letters for numbers. In the Greek, this name was understood in the second century A. D. to have originally been spelled Lateinos. It signifies "Latin man" or "the name of Latium," from which region the Romans derived their origin and their language. This word, too, signifies "Roman." In the Greek, L is 30, A is 1, T is 300, E is 5, I is 10, N is 50, 0 is' 70, S is 200. Count these figures. They count to exactly 666! But the same number — 666 — was also branded in Latin on the man who dominated the puny sixth head of the symbolic beast. Mussolini called himself "II Duce." Italians shouted "Viva II Duce!" which means "long live the chief." Everywhere in Italy was found the printed sign, "vv il duce." The "vv" is the abbreviation used for "Viva." A "V " is used instead of the "U" as is very commonly done. While this is a greeting, or title, Mussolini actually employed "II Duce" as a name. It is in Latin. Count it. V is 5, V is 5, I is I, L is 50, Dis 500, V is 5, Cis 100, E has no number. Now count them, and you have exactly 666! But, some will ask, does not this number apply to the pope? Some teach "the words 'Vicarius Filii Dei ' are on the pope's triple crown." The pope does, on some occasions, wear a triple crown, but these words are not on it! We should prove all things. The denomination that teaches this sent Professor C.T. Everson to Rome, where he gained access to and searched the Vatican archives, but he could find no crown or record of such a crown containing these words. Furthermore, these words are in the Latin, not a Bible language. This is not a name, but a title, and it is the name of the beast, and the number of the name of the man of the beast, we are told to count. Further, this Latin title does not apply to a kingdom, or empire, but alone to a man. And so the number 666 is branded on the Roman Empire, on the founder and first king of the Latins, on every Roman, and even on Mussolini. Could anything be any more conclusive? Satan has his civil government on earth. He gave this government "his power, and his seat, and great authority." He also has organized religion as his instrumentality in deceiving the world. In II Corinthians I 1:14, we find Satan is transformed into an "angel of light." According to Revelation 12:9 and 20:3, he has deceived the whole world. Paul tells us in II Corinthians 11:13-15. Satan has his ministers who pretend to be the ministers of righteousness, but are actually false apostles, deceitful workers, calling themselves the ministers of Christ! Therefore they claim to be Christian ministers. They are the many, not the few, because all prophecies say it is the many, not the few, who have been deceived. Satan's main labor for 6,000years has been the deceiving of the world. Now turn to the 13th chapter of Revelation, beginning with verse II: "And I beheld another beast coming up out of the earth; and he had two horns like a lamb, and he spake as a dragon." Some say it will be the United States aligned with the papacy. Some believe it is a federation of Protestant churches. Others declared it the Pan-American Union. Most church organizations ignore this very vital subject completely, or say frankly, "We do not know!" Why this widespread ignorance, when the answer ts so plain? Yes, why indeed? Remember, first, the Bible interprets its own symbols! When men put their own interpretation on Bible symbols, their conclusions are always false! Notice, after John saw one beast, which we have proved to be identified as the Roman Empire, he now sees ANOTHER — a different — beast rise up. We have learned that "beast" is a symbol for a kingdom, or civil government, and the term represents either the kingdom or its leader, as the case may be (Daniel 7:17, 23). So this other beast with the two horns is the prophecy of another kingdom or government. In these prophecies, God pictures to us the earthly gentile governments as the wild beasts whose characteristics describe them. This two-horned beast appeared as a lamb. But actually it spoke as a dragon — its true characteristic — for "out of the abundance of the heart the mouth speaketh" (Matthew 12:34). What does the word "lamb" symbolize, in the Bible? The answer is, Christ (John 1:29, Revelation 17:14). And "dragon" is a symbol of the devil (Revelation 12:9, 20:2). So here is some kingdom or government appearing as that of Jesus Christ, or the Kingdom of God. Christ did not set up a government (kingdom) at His first appearing on earth. After His resurrection the disciples asked Him if He would at that time restore the Kingdom (Acts 1:6), but He did not. The Church is not the Kingdom. Because some thought it was, Jesus spoke the parable of Luke 19:11-27 to show that He first must ascend to His Father's throne in heaven to receive the royal power to become King of kings, to set up the world-ruling Kingdom of God. But Satan is a deceiver, and he has deceived the world into supposing his (Satan's) system of churches is the Kingdom of God. Now notice carefully Revelation 13:12: "And he exerciseth all the power of the first beast before him." The first beast is the Roman Empire. Here is another government pretending to be Christ's government, the Kingdom of God, taking, exercising, using, employing all the power of the first kingdom. Now when? "He exerciseth all the power of the first beast before him, and causeth the earth and them which dwell therein to worship the first beast, whose deadly wound was healed" (verse 12). So, it was after the deadly wound (of A.D. 476) was healed. It was healed when Justinian brought about the restoration of the Empire in the West in A.D. 554. Consequently this religious government exercised power after A.D. 554 when the Roman Empire was restored. So here we have pictured a government — a religious government — appearing as Christ's government, masquerading as the Kingdom of God, actually ruling the civil Roman Empire after A. D. 554. For the entire 1,260 years, the emperors acknowledged the supreme power. of religion. The church was organized as a government — as a dual, twofold government (symbolized by its two horns or kingdoms — for "horns" symbolize kingdoms, also — see Daniel 7:24). It embodied church government, and it also was a state or civil government, always occupying a certain amount of territory over which it, alone, ruled as an independent sovereign state — in addition to actually ruling over the vast civil kingdom called the Holy Roman Empire. Even today, it is a separate, independent, sovereign state. Notice, this second beast was to wield power over all the earth, because it was to cause the earth, and them that dwell therein, to worship this first beast "whose deadly wound was healed" — after 554. In most any encyclopedia, under "Millennium," you will read the history of this very event — of how the "Holy Roman Empire" was called the "Kingdom of God upon earth." They claimed the Millennium had arrived! Notice Revelation 13:14: "And deceiveth them that dwell on the earth by the means of those miracles which he had power to do in the sight of the beast." Verse 13 says, "He doeth great wonders." 1) This beast performs great miracles. 2) He performed them "in the sight or' the Holy Roman Empire, or the first beast. 3) With them he deceived all nations. Where else in the Bible prophecies do we find these same identical facts? First, note Revelation 17. Here is pictured a woman. In II Corinthians 11:2, Ephesians 5:22-27 and elsewhere, we learn that "woman" is a symbol for church. This woman is a fallen woman — an apostate church — pictured as ruling over many nations (Revelation 17:1, 15). In Revelation 17:3, this false church is pictured sitting on a beast "having seven heads and ten horns." A woman riding a horse guides, controls, the horse. It does her bidding. Notice, verse 18, that this woman is "that great city, which reigneth over the kings of the earth." Notice, verse 2, the inhabitants of the earth have been deceived by this counterfeit Christianity. Also, Revelation 18:3, she has deceived all nations. Next, notice II Thessalonians 2:3-4. The day of Christ - and the coming of Christ — shall not come, until there be a falling away, and a "man of sin" be revealed. He exalts himself above all that is called God. As God, he sits in a temple claimed to be the temple of God, showing himself to deceive people into accepting him as God. God is our holy Father. This final man, in a religious office, will claim the same title. This wicked man is to be destroyed at, and by, Christ's coming (verse 8). Notice verses 9-10: "Even him, whose coming is after the working of Satan with all power and signs [miracles] and lying wonders, and with all deceivableness of unrighteousness." Here is an important religious figure who is prophesied to perform miracles and lying wonders, with which he deceives people everywhere. This deceiving religious ruler will still be active clear down to Armageddon and the Second Coming of Christ! In Revelation 16:13-16 are described three foul spirits. They come from the dragon, which is the devil; from the beast, which is the civil Roman ruler; and from the mouth of the false prophet associated with him. "For," continues verse 14, "they are the spirits of devils [demons], WORKING MIRACLES, which go forth unto the kings of the earth and of the whole world, to gather them to the battle of that great day of God Almighty." And they are gathered, finally, at Armageddon! Note it! Yet future, the Roman ruler, as the Roman Empire, is again restored, along with a great religious leader — and all in the power and influence of the devil! Working miracles! All prophecies concerning them show these powers doing the same things! Now notice the last battle of "that great day of God Almighty." It is in Revelation 19:19-20. Here is pictured the beast — "and with him the false prophet that wrought miracles before him, with which he deceived them that had received the mark of the beast, and them that worshipped his image." 2) Both perform them before, or in the sight of, the beast. 3) With them, both the false prophet and two-horned beast deceive them that have the mark of the beast — cause them to receive that mark (Revelation 13:16). Certainly, then, this two — horned beast, the false prophet, the man of sin and the woman that rode the beast are all picturing a counterfeit Christianity. "And deceiveth them that dwell on the earth" — how? — "... saying to them that dwell on the earth, that they should make an image to the beast, which had the wound by a sword, and did live. And he had power to give life unto the image of the beast, that the image of the beast should both speak, and cause that as many as would not worship the image of the beast should be killed. And he causeth all, both small and great, rich and poor, free and bond, to receive a mark in their right hand, or in their foreheads: and that no man might buy or sell [trade, earn a living, hold a job], save he that had the mark, or the name of the beast, or the number of his name" (verse14-17). receive the mark of the beast (compare Revelation 19:20), but also perpetrated the forming of an image that caused the martyrdom of saints. As many as would not worship this image were caused to be killed. This false church did not kill them — she caused them to be killed. History shows that the civil government martyred millions who were declared "anathema from Christ" or "heretics." Compare with the woman who rode the beast in Revelation 17: "And I saw the woman drunken with the blood of the saints, and with the blood of the martyrs of Jesus" (verse 6). Certainly these are one and the same. Now this ecclesiastical organization, which is a twofold government, deceived the people by saying they should make an image of the beast. Note it (Revelation 13:14) — that is how it deceived people. What is an image? The dictionary says a "likeness," a "copy, representation, model, semblance, counterpart." So here is a church saying, "Let us make a model , or counterpart, of the civil Roman government" — for that is what the beast is. Jesus Christ proclaimed the Kingdom, or government, of God- divine government by will of God and by God's law — not paganized human government by will of man and man-made laws. His Church includes all Spirit begotten saints who have and are led by the Holy Spirit. Christ is its only Head, and His Kingdom is not of this world! Where , then, did human church government derive its present form? "The first pope, in the real sense of the word, was Leo I (440-461 A. D.)," says the Cyclopedia of Biblical, Theological and Ecclesiastical Literature, Vol. 7, page 629. To him the form of government of the Roman Empire was the most marvelous thing on earth. He applied its principles to the church, organized the church into a government, forming the papacy. This church government is the image of the beast. Says Myers' Ancient History: "During the reign of Leo I, the Church set up, within the Roman Empire, an ecclesiastical state [government] which, in its constitution and its administrative system, was shaping itself upon the imperial model." This church government, then, according to this historical authority, is in fact a model, a counterpart, an image of the beast, which is actually the Roman Empire government. But this church became a mother: and daughter churches came out of her in "protest," calling themselves "Protestant." And all have worldly, political church government. "Upon her forehead was a name written, MYSTERY, BABY LON THE GREAT, THE MOTHER OF HARLOTS" (Revelation 17:5). Her daughters are called "harlots." Together, they are called "BABYLON." They are pagan, teaching pagan doctrines and customs, cloaked in the name of Christianity! And all nations are deceived! Yes, human-organized churchianity, not Bible-designed spiritual-organism government, is the image of the beast. It is the pagan political counterfeit of God's true government. "Come out of her," God says (Revelation 18:4). God help us to heed!